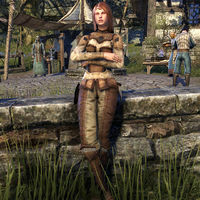 Andree is a Breton smith who can be found near the Alcaire Castle branch of the Mages Guild. When spoken to, she'll complain, "The shops charge too much, and I don't think they're entirely honest. As soon as the roads are a bit safer, I'm going back to Wayrest."